11-year-old Cousins, Wendy Anderton and Cathie Jones pose with the tail section of a Heinkel He 111P-2 of 8./KG27 which crashed landed by their home at Border House Farm near Chester in Cheshire, August 14th 1940. The five crew survived and were taken prisoner and the 'kill' was claimed by the Spitfire of P/O P. Ayerst, Nº 7 OTU. "It occurred at approx. 1930 hrs, weather good, 14/08/40. Peter Ayerst, Hallings-Pott & McLean all heard explosions and saw an (only one) aircraft "5 miles away". The bombs were being dropped on the training school at RAF Sealand. All 3 scrambled (the aircraft were just being put away for the day). Heinkel He111 was spotted at 2000' over Sealand, about to start a second run. Hollings-Pott & Mclean attacked and scored minor hits. Peter attacked and must have hit engines as it rapidly lost height. Other 2 Spits returned home, Peter stayed with Heinkel to watch it crash land. It was witnessed by 16 year-old Syd Lawrence (the band-leader). The aircraft shot past the bottom of Salisbury Street, Shotton at about 9pm, no more than 20' above the ground pursued by Peter's spit. The Heinkel flew under some pylons, nice wheels up landing and stopped 50yds short of a farmhouse. The 5 crew were made POW's but had planted detonators which blew up and only the tail and half of the fuselage remained. The next day the 3 Spit pilots and others travelled the 5 miles to view the wreck. 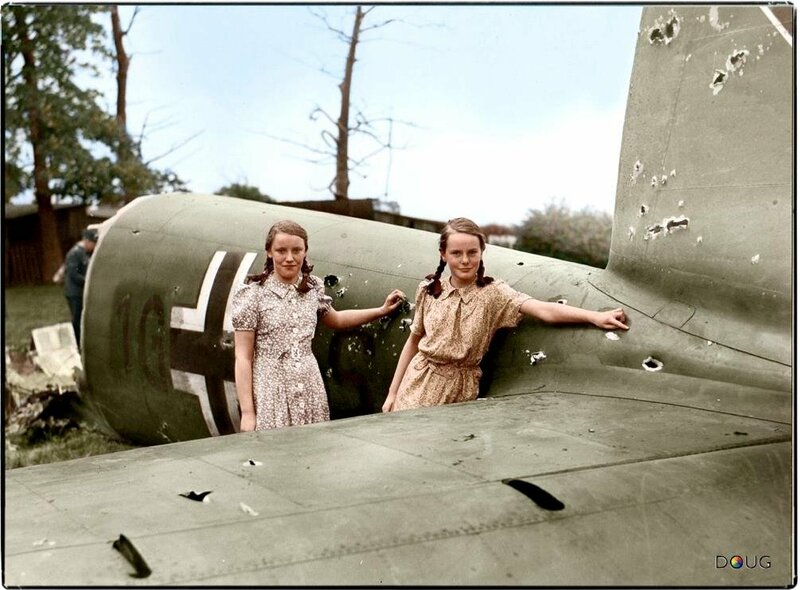 German crew - Fw. Heinrich Rodder (Nav. ); Oblt. Artur Wiesemann (pilot); Uffz. Walter Schaum (Flt. Mech. ); Uffz. Heinz Kochy (Radio Op. ); Uffz. Gustav Ullmann (Gunner). 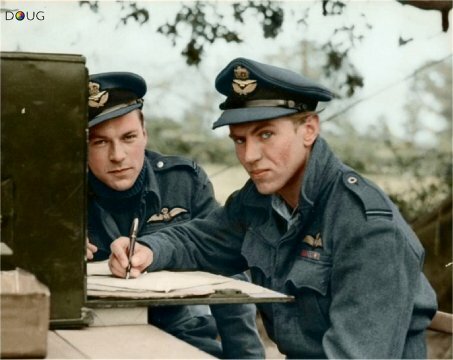 RAF Kenley in Surrey, late 1943. 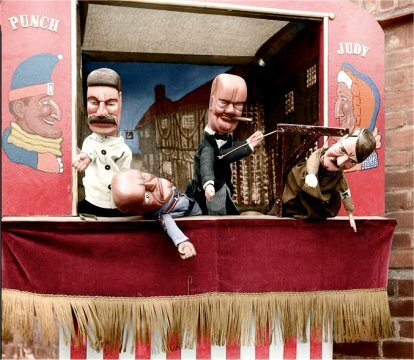 Stalin, Mussolini, Churchill and Hitler. 23rd August 1941. 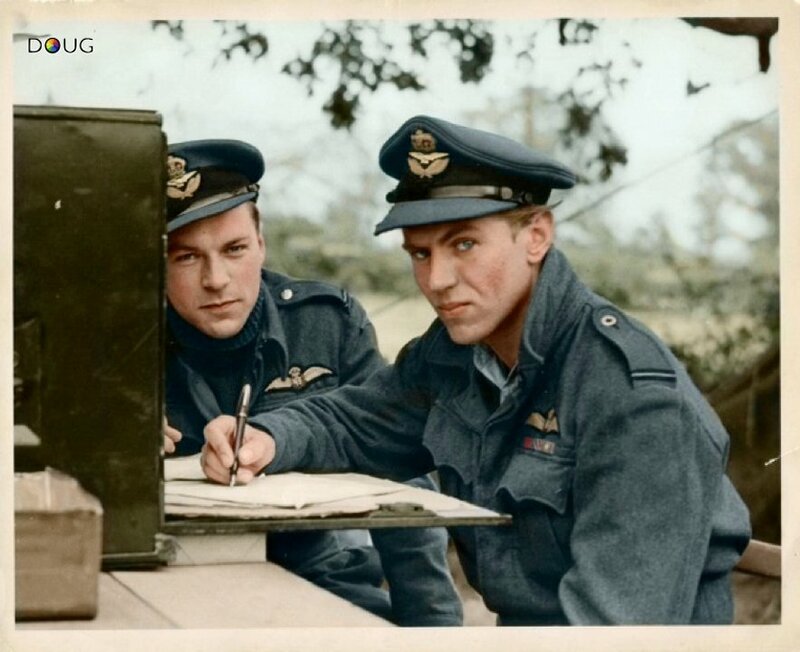 Acting Squadron Leader Roland Robert Stanford TUCK, D.F.C. (37306), No. 257 Squadron. "This officer has commanded his squadron with great success, and his outstanding leadership, courage and skill have been reflected in its high morale and efficiency. Since 4 October 1940, he has destroyed four hostile aircraft, bringing his total victories to at least eighteen." 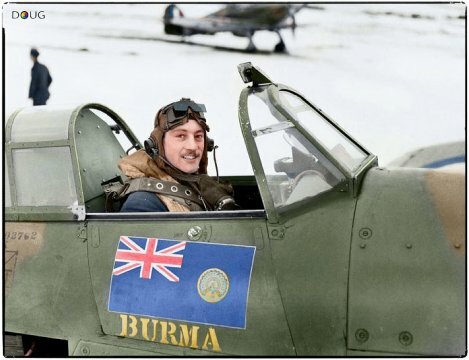 The Burmese flag is seen painted on the starboard side of the aircraft and on the port side were painted 26 victory symbols. When author Tadanori Hayakawa looks at life in Japan during World War II, his eye is drawn to the bizarre. Take the case of nudism: At some schools, both the pupils and teachers wore only underpants or trousers to become physically stronger. 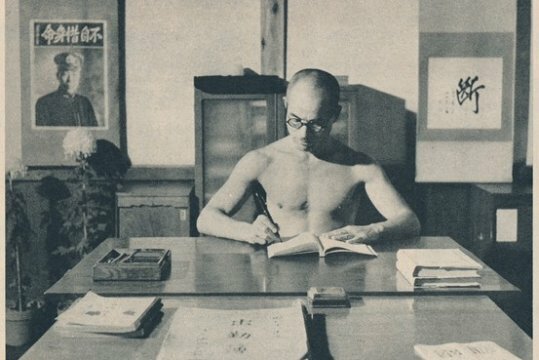 A photo from 1943 shows that even a principal was working almost naked at his desk. A magazine for homemakers gave advice on how to grow opium poppies for use as anesthetics during a medicine shortage. Readers were told to go to government health offices for free seeds. Many other books have described the militarist rhetoric and emperor worship that pervaded the years before and during the war. 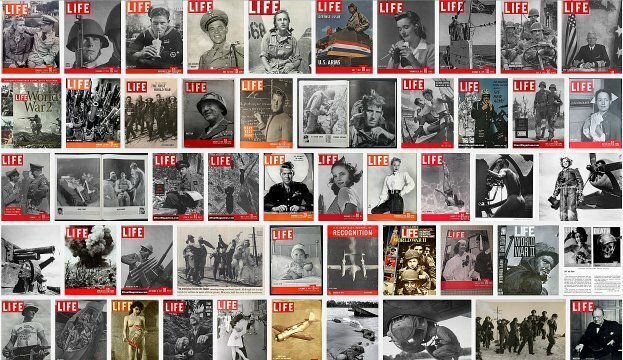 In two books published this year, the 41-year-old Mr. Hayakawa, an independent writer and editor, focuses on lesser-known ways that imperial propaganda filtered down into Japanese daily life, drawing on his study of government documents, magazines and ad fliers from the 1930s and 1940s. “These days, there has been much praise and glorification of the past. I wanted to ask people in a playful way, ‘Is this really what you want? 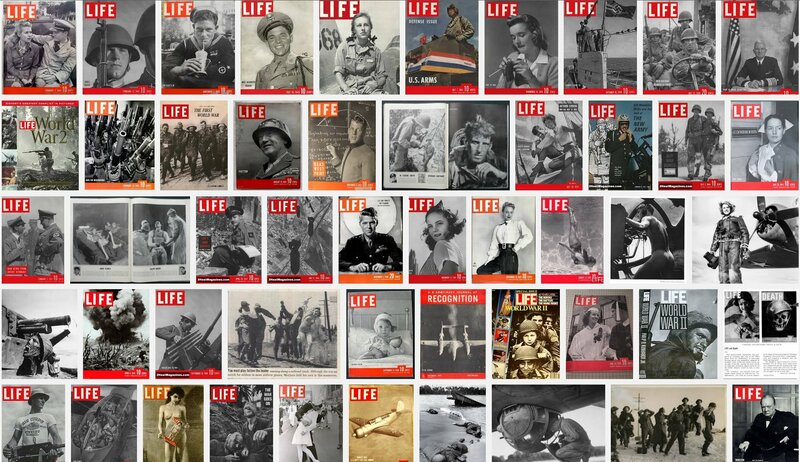 Are you indeed willing to go back to this kind of life?’ ” Mr. Hayakawa said in an interview. One book, “Ways to Show Your Love for the Nation,” was published in January by Seikyusha with an initial printing of 5,000 copies. The other, “Outrageous Battle Life in Divine Japan,” from Chikuma Shobo hit bookshops in February with a printing of 10,000 copies. Both have been selling well and have been reprinted, the publishers said. 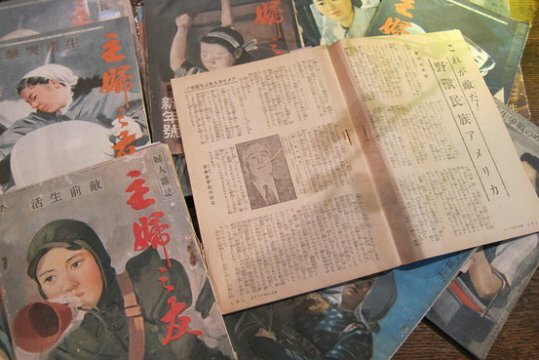 Mr. Hayakawa’s research showed how police routinely checked on the wives of soldiers away at the front to keep the women from having adulterous affairs and ensure their husbands could fight without worry. When detectives caught wind of a visit by a paramour to a lonely wife, they would ambush and arrest him. One magazine told readers how to make pickles when there wasn’t enough salt, saying they should go to the seashore and bury vegetables in the sand. The next day they could dig at the spot and find good pickles, according to the magazine. Mr. Hayakawa has been gathering his materials for about 20 years, sometimes trading with collector friends who have different interests. “Prices at used bookshops tend to be high. I usually search antique shops and visit trash dealers,” he said. The number of items has reached some 5,000. Mr. Hayakawa said he rented a space for many of them eight years ago, after his wife complained about the smell of so many old papers. The two book projects started after Prime Minister Shinzo Abe took office in late 2012 and raised issues that carried echoes of World War II, such as proposing a greater role for Japan’s military. “My friends say I’m lucky. They tell me if Mr. Abe weren’t in office, these books wouldn’t have sold as much,” Mr. Hayakawa said. 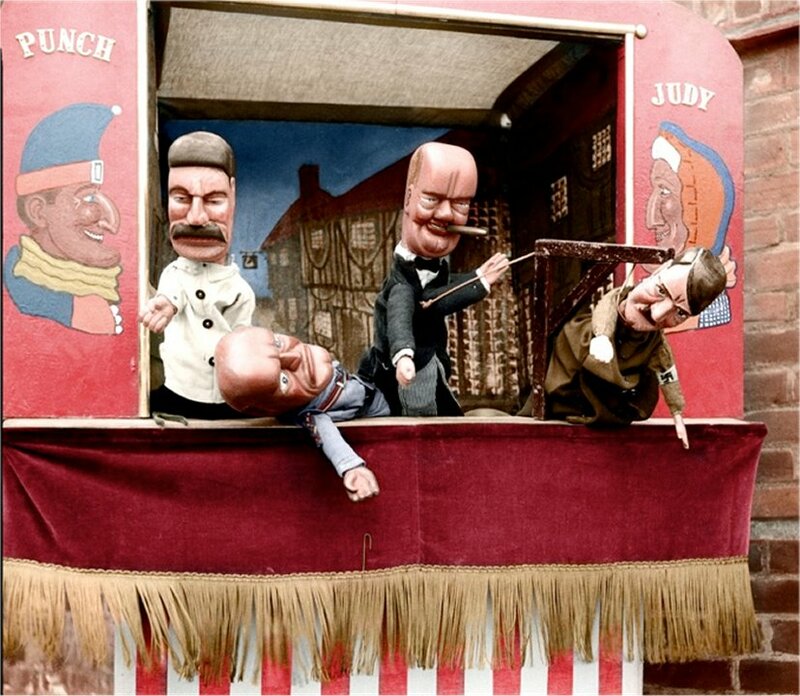 Some readers have criticized him for making fun of earlier generations. But Mr. Hayakawa said he was genuinely interested in the ideas and ways of life shown in his unique collection of materials. “Most readers enjoy them. Many have said, ‘Oh, this is just like North Korea,’ ” he said. A Japanese school principal is shown at his desk in this 1943 photo. Students and teachers sometimes went without clothes to toughen their bodies. collected by author Tadanori Hayakawa. 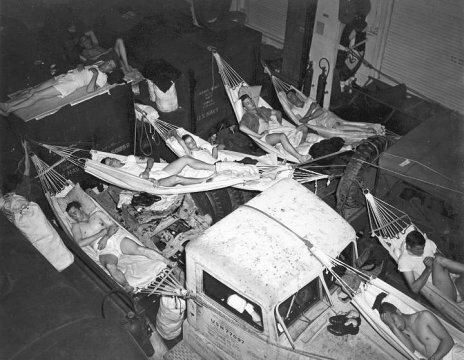 Personnel sling hammocks where available during transport back to the States on board Intrepid (CV 11) as part of Operation Magic Carpet. This image is part of a photograph album detailing the wartime service of the carrier Intrepid (CV 11) in the Pacific during World War II. 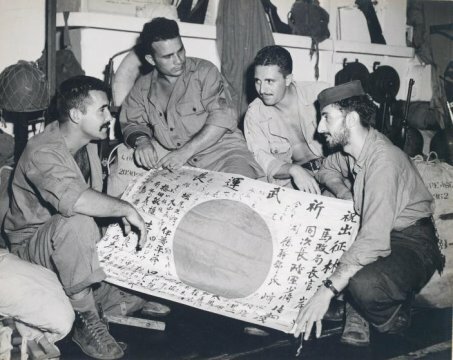 Marines show a sailor a captured Japanese flag while en route home to the States as part of Operation Magic Carpet. This image is part of a photograph album detailing the wartime service of the carrier Intrepid (CV 11) in the Pacific during World War II. 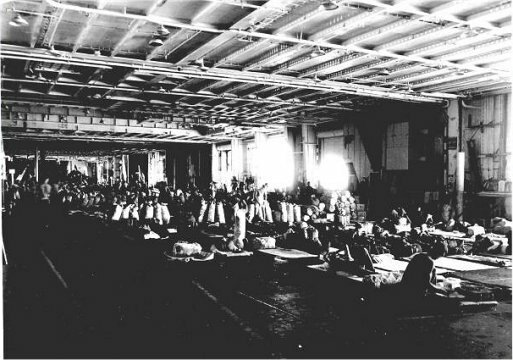 Personnel being transported back to the States on board Intrepid (CV 11) during Operation Magic Carpet. This image is part of a photograph album detailing the wartime service of the carrier Intrepid (CV 11) in the Pacific during World War II. 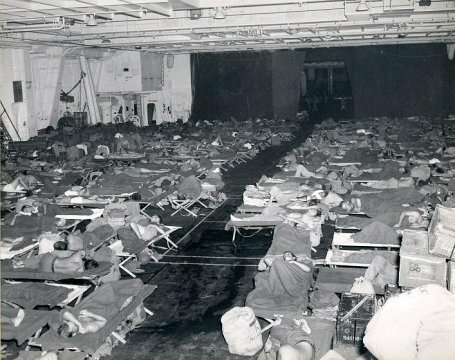 Troops heading back to the States as part of Operation Magic Carpet crowd the hangar deck of Wasp (CV 18). This image is part of a photograph album that was acquired by RADM Joseph C. Clifton during his service as Executive Officer of Wasp (CV 18) during World War II. 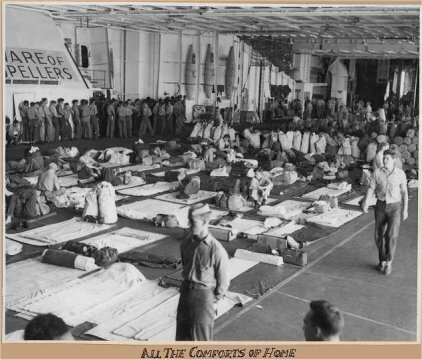 Troops heading back to the States as part of Operation Magic Carpet crowd the hangar deck of Wasp (CV 18). This image is part of a photograph album that was acquired by RADM Joseph C. Clifton during his service as Executive Officer of Wasp (CV 18) during World War II.